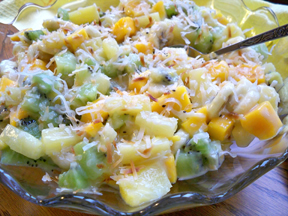 A sweet salad that goes well with any meal. 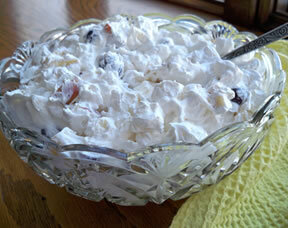 Grapes, apples, bananas, and marshmallows, it couldn't get any easier. It is a great salad for kids. Slice grapes in half and put in a medium bowl. Core the apples and cut into triangles; add to the grapes. Slice bananas and add to the bowl. 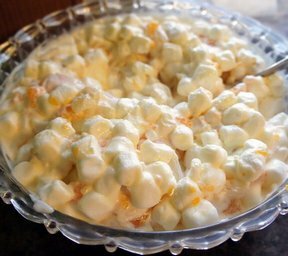 Add the whipped topping and stir gently to coat everything evenly. Add the marshmallows and fold into the mixture. Note: If very young kids will be eating this salad you may want to peel the apples. Otherwise the apple peel adds nice color. "This is an excellent last minute salad that you can throw together and it goes great with any meal. Perfect for when you are getting last minute company for dinner!" 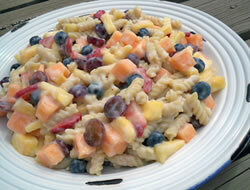 "So simple to make and my kids loved this fruit salad!"